Moku Whipping (also known as Moku Hitching) is a decorative way of whipping, that’s also very secure. It’s a whipping technique that doesn’t require a palm or needle and will leave your lines looking pretty smashing. TIP! 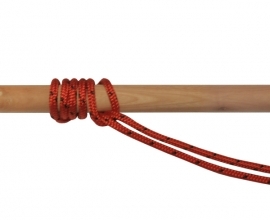 Try Moku Whipping with a thicker twine or VB Cord to decorate and create grip on handles, railing and steering wheels. 1. 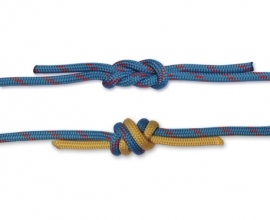 Start with an Overhand Knot in center of your twine and tie it towards the end of your line. 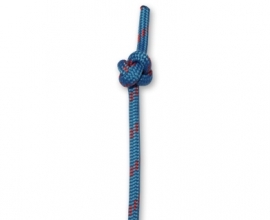 This Overhand Knot will be the bottom of your whipping so be sure to leave enough tail on the rope to work with. 2. Make a Half Hitch in the right length of twine by making a full counter clockwise turn around your rope and tucking it through itself. 3. Repeat step 2 in the left length of twine, but this time go clock wise. Pull tight. Make sure the lines only cross at the start of your Half Hitch for a neat effect. 4. Keep repeating step 2 and 3, alternating sides with each hitch until your whipping is at least 1½ times longer than the rope is wide. 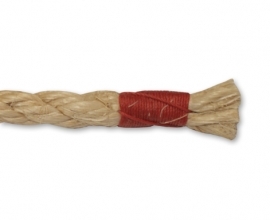 To secure your whipping, make another Half Hitch but this time tuck the twine through itself once more. Pull tight and repeat on the other length of twine. 5. Trim off the excess twine and your done!